Lama Zopa Rinpoche, France, October 2011. Ganden Tendar Ling Study Group Becomes a Center! 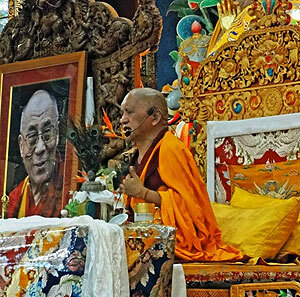 While in Kopan, Lama Zopa Rinpoche gave some teachings to the monks and nuns. 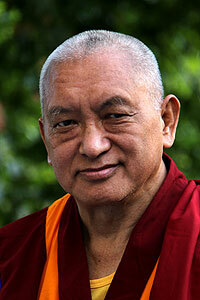 Rinpoche kept the teachings brief (for Rinpoche) – about two hours. If it went longer, Rinpoche’s speech started to get tired. Rinpoche is in France continuing with rehabilitation. The treatment is going well, especially with Khandro-la’s assistance. The main focus is on Rinpoche’s right arm and leg. Rejoice! The Nagarjuna statue that was initiated in June 2009 for Lama Zopa Rinpoche’s health and long life has been finished! 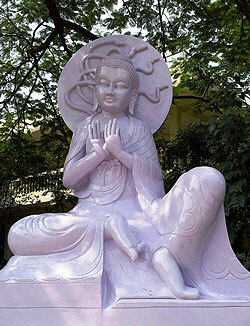 The statue is at Root Institute, Bodhgaya, India. It is 14 feet (4 meters) tall and made from the best quality marble. The Nagarjuna statue at Root Institute, Bodhgaya, India, was carved for Lama Zopa Rinpoche’s health and long life. Sincere thanks to all who donated towards the statue, and special thanks to director of Root Institute Ven. Trisha and Tony Simmons. 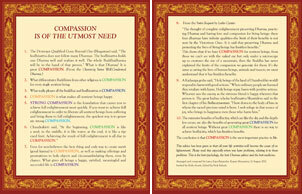 Rinpoche recently composed 10 inspiring quotes on compassion with the wish for them to be beautifully designed so that they could be printed, framed and displayed on one’s wall to be read and reflected upon, used in one’s daily prayers, and serve as a motivation, as a basis for meditation, and as a reminder of what is of utmost importance in one’s life. They are now freely available in several formats on Rinpoche’s Advice page. When Rinpoche recently heard how hundreds of thousands of animals would be sacrificed during Dashain (a 15-day Hindu religious festival), Rinpoche immediately started to check what prayers and pujas should be done to help all the animals have a good rebirth as well as to help those who perform the sacrifices. Rinpoche then requested all the Sangha of Sera; Drepung; Ganden; Gyuto; Gyurme; Jangchub Nunnery; Kopan Monastery and Nunnery; Trulshik Rinpoche’s monastery; Thuptop Rinpoche’s monastery; Tamo Ani’s nunnery; Chenrezig Nuns Community and Nalanda Monastery to do extensive Medicine Buddha pujas and for some to do nyung nays. Rinpoche himself with Khandro-la also did extensive prayers. More than 10,000 monks and nuns made strong prayers specifically for all sentient beings, and in particular for all the animals that are killed around the world, particularly for the animals that were being sacrificed in Nepal and India for Dashain so that they are reborn in a pure land or have a perfect human rebirth, meet a Mahayana guru and achieve enlightenment as quickly as possible. Also, prayers were made for those who do the killing so that their negative karma is purified quickly and that they may be reborn in a pure land or have a perfect human rebirth, meet a Mahayana guru and achieve enlightenment as quickly as possible. We project that the cost for the offerings for all the pujas will be between US$15,000-$20,000. If you would like to support these pujas and others like them, you can make your donation through the Animal Liberation Fund. NEW! Living in the Path Instruction Module 02 – Refuge & Bodhichitta. In this module, Lama Zopa Rinpoche gives commentary on the meditations related to each part of the verse for Taking Refuge & Generating Bodhichitta that starts almost every single practice that we do. By understanding how renunciation, bodhichitta and emptiness can be cultivated within this opening prayer, we can assure that every practice we do accomplishes our ultimate goals. NEW! Living in the Path Module 08 – The Secret of the Mind. In this module, Lama Zopa Rinpoche shows us that mind – rather than external conditions – is the source of all phenomena, with karma acting as the agent for happiness or suffering. Learn the results of specific non‐virtuous actions and their opposites. Get motivated to put an end to samsara, a life contaminated by delusions and karma. Finally, discover four powerful ways to collect merit, the cause of all success. NEW! Expanded version of Taking the Essence all Day and Night, now available in e-book format (or purchase the original hard copy and get the new expanded downloadable version for free!) This version includes extra commentary, motivations for life and morning meditations by Lama Zopa Rinpoche to establish our bodhichitta motivation daily. NEW! Rituals and Procedures for Commencing Retreat now available in e-book format. A very helpful companion when starting a retreat of any length. NEW! Vajra Cutter Sutra now available in e-book format. 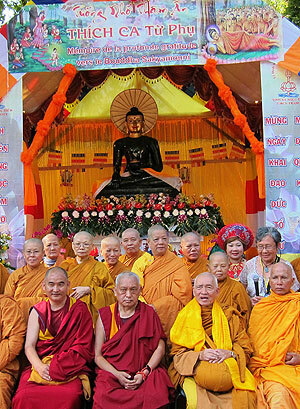 After arriving in France, Lama Zopa Rinpoche (front row, second from left) paid a surprise visit to the Jade Buddha for Universal Peace in Paris. Mandala‘s new print issue is now available! This issue includes extensive articles on the life and accomplishments of two special figures connected to the FPMT: His Holiness the Dalai Lama and Khensur Rinpoche Lama Lhundrup Rigsel. We also feature Lama Zopa Rinpoche’s newest dedication prayer Remembering the Kindness of His Holiness the Dalai Lama and the Tibetan People; a report from FPMT’s historic first international translation conference; a profile on the Sherpa artist Gelek; plus many offerings from our standard sections. Mandala‘s website is a rich source of articles, teachings, blogs and has a fully searchable archive of articles from Mandala‘s 24 years of publishing. FPMT centers in Spain, such as Nagarjuna Barcelona, share a common logo, changing the banner to reflect each individual center. We are delighted to announce the dates for CPMT 2012, which is being hosted by Root Institute, Bodhgaya, India. The CPMT meeting will be November 9-15, 2012. In November 2010, Rinpoche gave updated advice about how to make one’s center, project and service logo most powerful. The Spanish centers followed this advice and decided to ask Rinpoche whether they could all use the same logo, but with the individual center name in a banner below it. Rinpoche really liked the logo and said he would be very happy if they all use a common logo as they suggested. The quick return prayer for Khensur Rinpoche Lama Lhundrup is now available in Tibetan and English. May the recitation of this prayer be the cause for Khensur Rinpoche to most quickly be born amongst us and again manifest as a perfect teacher and guide. Ganden Tendar Ling in Moscow, Russia, which began as a study group in 2001, has just affiliated with FPMT, Inc. and become a center – congratulations! LRZTP (Lotsawa Rinchen Zangpo Translator Programme) is the successful FPMT four-year interpreter training program that includes two years spent learning Tibetan and interpreting skills in a classroom setting in India, and two years spent developing and honing those skills by interpreting for a geshe in an FPMT center. Five previous LRZTPs have helped more than 30 individuals become qualified to interpret for Tibetan geshes into many languages. The newest program, LRZTP 6, will begin in Dharamsala, India in September 2012. Application forms will be available very soon. FPMT International Office is looking for an Education Services director – application extended to October 23! Also there is an opportunity to offer service as director of LRZTP 6 in India.